One of the first questions users ask when considering the move from a traditional benchtop fluorimeter to a compact, modular fluorescence system is, “Does a diode array spectrometer have enough sensitivity for my fluorescence measurement?” Many compact spectrometer manufacturers claim high sensitivity thanks to use of high quantum efficiency detectors, or low noise due to thermo-electric cooling (TEC) of the detector and/or vertical binning of the pixels in a 2D array. While all of these factors can improve the signal to noise ratio (SNR), the essential questions remains unanswered: What is the system limit of detection? What is the lowest concentration it can quantify? How quickly can it be measured? 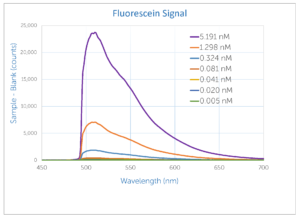 In this tech tip, we’ll explain how limit of detection (LOD) and limit of quantitation (LOQ) are defined and measured, walking you through the data analysis using our WP VIS fluorescence system as an example with fluorescein as the analyte. By using our own highly efficient volume phase holographic (VPH) gratings in a diffraction-limited transmissive design, our spectrometers maximize sensitivity and reduce stray light significantly as compared to other compact spectrometers of similar cost. 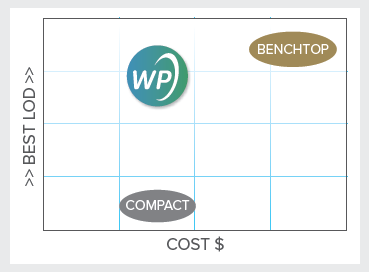 In fact, we feel obliged to show you the data to convince you of its picomolar sensitivity – it’s within a factor of 10 of much more expensive benchtop systems! Limit of detection (LOD) is defined as the lowest quantity or concentration of a component that can be detected with reasonable certainty using a given analytical method.1 It answers the simple questionof presence vs absence for a given concentration without quantification. 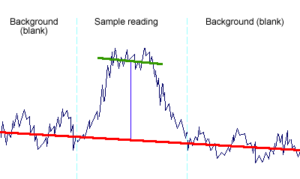 It requires the ability to clearly distinguish a sample reading (green line) from the background of the blank or reference (red line). The difference between the two is the signal (blue vertical line). As can be seen, this is limited by the noise on the measurement. Noise in a spectrometer measurement has several contributors – thermal noise (also known as dark noise, in which the detector conducts some current even without any light on the detector), shot noise (often called counting noise, arising from the statistical probability that a photon will generate current), and readout noise (due to detector circuitry). Fixed pattern noise occurs in some diode array detectors, but can be subtracted out using a blank. Stray light also contributes to noise in a system. Fluorescein is the most common fluorophore used for quantifying LOD and LOQ for a fluorescence measurement system. It is easily excited by an LED with center wavelength <500 nm, and emits a well-defined spectrum peaking at ~510 nm. LOD and LOQ of fluorescein are reported regularly for high-end benchtop fluorimeters, but very rarely for small-footprint, diode-array based fluorescence spectrometers. A series of dilutions from 5 nanomolar (nM) to 5 picomolar (pM) of fluorescein were prepared using 0.1 sodium hydroxide solution and measured in a 10 mm pathlength quartz cuvette. The fluorescence measurement system consisted of a WP VIS spectrometer with our own quick-fit cuvette holder, and a 450 nm LED for excitation. The WP-VIS was configured with a 50 μm slit for free-space coupling, with 4 nm resolution from 400-800 nm. The quick-fit cuvette holder mated directly to the free-space coupling bulkhead on the spectrometer, providing access to the spectrometer’s full f/2.0 field of view for maximum light collection. Each sample concentration was measured 50 times at a 50 ms acquisition time, with no data averaging or smoothing applied. The same measurement was made for the blank or reference. 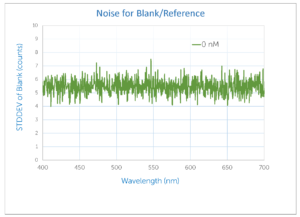 Each set of spectra were then averaged, and the signal for each sample was calculated as a function of wavelength (sample intensity – blank intensity). Signal was found to decrease linearly with concentration for the higher concentrations. The standard deviation (stddev) of the 50 blank (reference) measurements was then calculated as a function of wavelength, and found to vary between 4 to 7 counts. As discussed earlier, the LOD is the concentration at which the signal is 3x the noise. 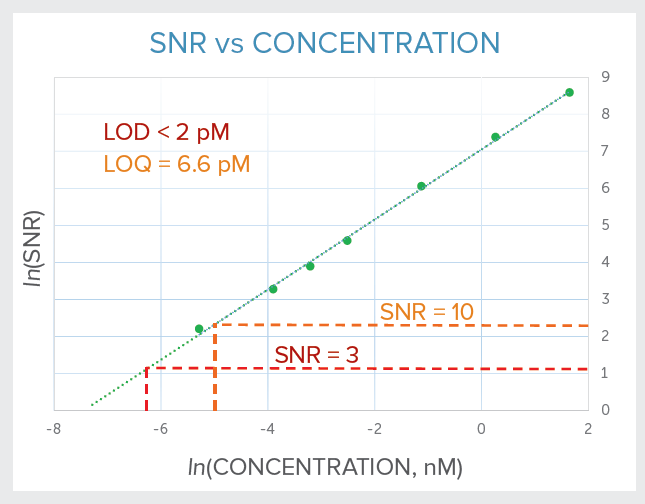 Once the SNR is calculated for each concentration using the signal (i.e., sample – blank) at the peak wavelength of interest and the standard deviation of the blank at the same wavelength (the noise), it is easy to identify the LOD as the concentration at which SNR=3 and the LOQ as the concentration at which SNR=10. Looking at the table above, it can quite comfortably be concluded that the LOD for the WP VIS fluorescence system with quick-fit cuvette holder is < 5 pM. This is surprisingly low given that a leading benchtop fluorimeter specifies 0.5 pM LOD for fluorescein at a much greater cost and footprint. The LOD and LOQ can be calculated much more accurately by plotting fluorescein concentration against SNR on a log-log plot. From this, we find a LOD of <2 pM and a LOD of 6.6 pM for fluorescein using the WP VIS and quick-fit cuvette holder. Note that a 50 ms acquisition time was used for all measurements, regardless of concentration. With use of a longer acquisition time and addition of 2-3 more dilutions to the experiment, it is very likely that the ~2 pM LOD value could be reduced further. LOD and LOQ are fairly simple measurements to take, and allow the performance of compact spectrometers to be directly compared to more sensitive benchtop systems. Achieving ~2 pM LOD, the WP VIS fluorescence system proves itself sensitive enough to rival the 0.5 pM LOD typical of an expensive benchtop fluorimeter. Sensitive, compact, and fast, it is an ideal tool for integration into biomedical instrumentation or the field. Contact us to discuss your fluorescence application today. McNaught, Alan D., and Alan D. McNaught. Compendium of chemical terminology. Vol. 1669. Oxford: Blackwell Science, 1997.